Mary Shelley was born Mary Wollstonecraft Godwin in London, in 1797. She was the daughter of feminist writer Mary Wollstonecraft. Her father was the atheist philosopher William Godwin. Her mother died ten days after Mary was born as a result of puerperal fever. Godwin realized that he couldn’t raise the girls himself, and looked for a second wife. He married Mary Jane Clairmont. Mary Jane was a woman with quick temper. She didn’t like Mary, and didn’t educate her as well as she educated her own daughter. Nonetheless, Mary received an excellent education, wich was unusual for girls at the time. Her father gave her access to his large library. She was encouraged to write stories, and one of her early works, “Mounseer Nongtopaw” was published by Godwin’s company when Mary was eleven. At the same time, Godwin let her listen to his conversations with intellectuals of the time. She met Percy Bysshe Shelley, who was unhappy with his marriage. They fell in love, but when Mary’s father found this out, he forbade them to see each other. Mary wanted to do what her dad said, but Percy threatened to suicide if he wasn’t with her. She realized that she had to be with him, and they escaped together. Once, Mary, Percy and Jane (Mary’s step sister who was with them) met with a couple of friends. The weather was rainy, so they had to stay indoors. They decided to have a ghost story contest. Mary was concerned she didn’t have any ideas for it. After this episode, she had a waking dream that inspired her to write Frankenstein. Mary and Percy were stunned by two family suicides in quick succession. Percy's first wife, Harriet, drowned herself in London's Hyde Park. Discarded and pregnant, Claire had not welcomed Percy's invitation to join Mary and himself in their household. Shortly after Harriet's death, Percy and Mary got married, now with Godwin's blessing. 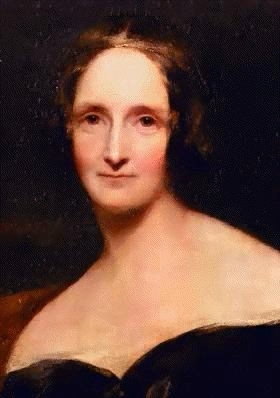 Their attempts to gain custody of Percy's two children by Harriet failed, but their writing careers enjoyed more success when, in the spring of 1817, Mary finished Frankenstein. Clara, their daughter, died in Venecia, this made a depression in their family. Only the birth of their new son made them happy again. In july of 1882 Percy died drowned in a shipwreck. Very interesting, girls, and complete too. Congratulations.